During the 1920s and 1930s, crime emerged as one of the nation’s greatest political and social issues as popular attention focused on the exploits of gangsters, bootleggers, public enemies, and crime waves. 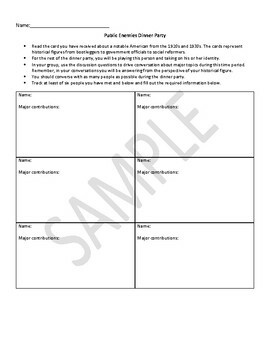 This activity allows students to be interactive, play, and learn by asking them to adopt the persona of a significant historical figure from the time period. 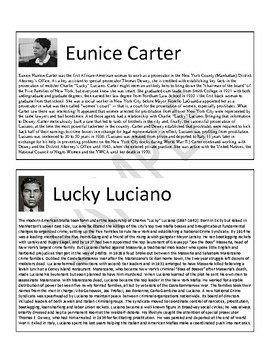 Thirty biographical cards represent notable bootleggers, government officials, gangsters, politicians, social reformers, and criminals. 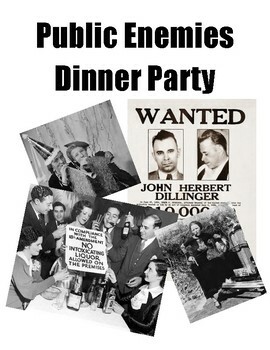 During the dinner party, guests interact with each other as their historical figure. 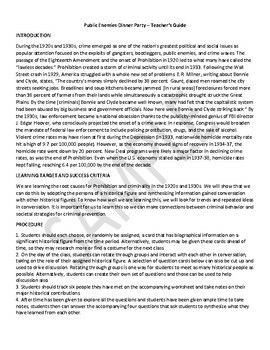 Provided discussion questions also help drive conversation about major topics during this time period, and through these conversations, students learn the root causes for Prohibition, its ineffectiveness, the criminal consequences of the Great Depression, the rise of federal law enforcement, and other topics. Students then synthesize what they learned a few questions.